The event encouraged supply side collaboration and reinforced Aqua-Hot's appreciation for its suppliers. It also stimulated conversation on new and current products, capacity increases, cost reduction and continuous quality improvement. Presentations were made by Aqua-Hot president and CEO Paul Harter, director of operations Troy Bell, and director of sales and marketing Harold Ogden. Aqua-Hot engineers answered technical questions at the product display section. In roundtable sessions, suppliers shared their companies' perspectives on the current manufacturing climate. Attendee David Corona noted, "It's a great opportunity to get together and network with other suppliers and exchange ideas." 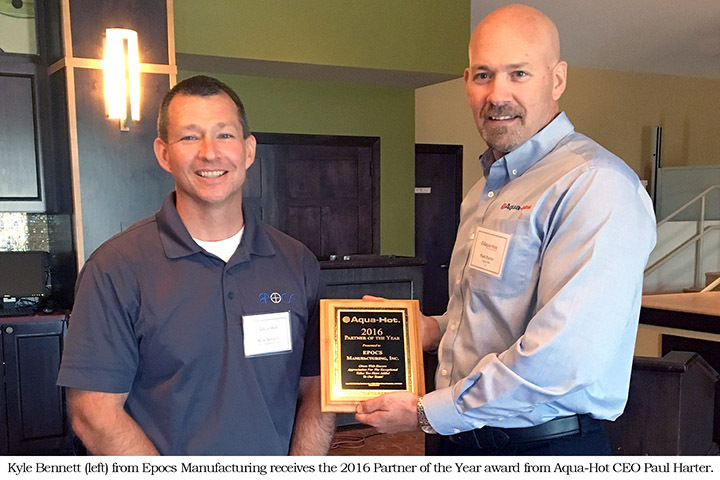 Aqua-Hot honored Epocs Manufacturing with its 2016 Partner of the Year award. The company was chosen for the exceptional value it brings to the Aqua-Hot team in terms of pricing, quality, delivery, communication and customer service. The Longmont, Colorado-based company is a precision sheet metal fabrication and machining company.